Pallet Gates are a part of our KEE GATE product range, they have been designed to provide a safe access solution for factory and warehouse workers who are responsible for loading and unloading pallets onto mezzanine floors or raised working surfaces. Transporting pallets around factories and warehouses can present a number of safety issues. This is particularly apparent when the worker has to load and unload pallets on mezzanine floors, as this could result in a fall from height. Kee Safety's pallet gates eliminate this safety issue, as they provide a simple solution that results in employees always being separated from the hazard. 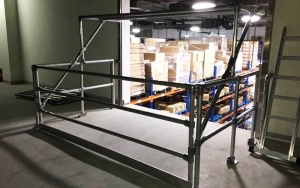 Our pallet gates are designed to fit seamlessly into a new or existing guardrail or barrier and ensure there is continuous protection in place while goods are being moved either up to or down from the mezzanine. 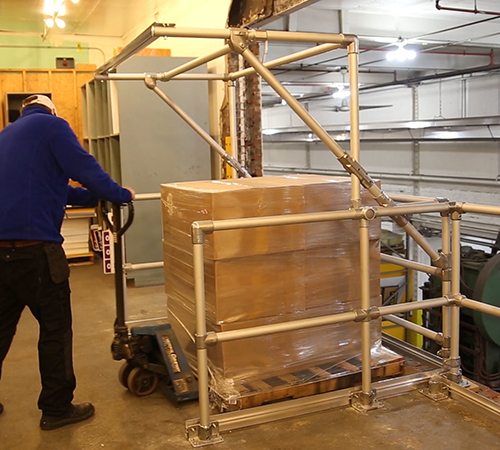 To ensure that our mezzanine pallet safety gates are reliable and comply with international standards, the products undergone stringent testing. All test reports are available upon request. KEE GATE Pallet Gates are constructed using KEE KLAMP and KEE LITE fittings. 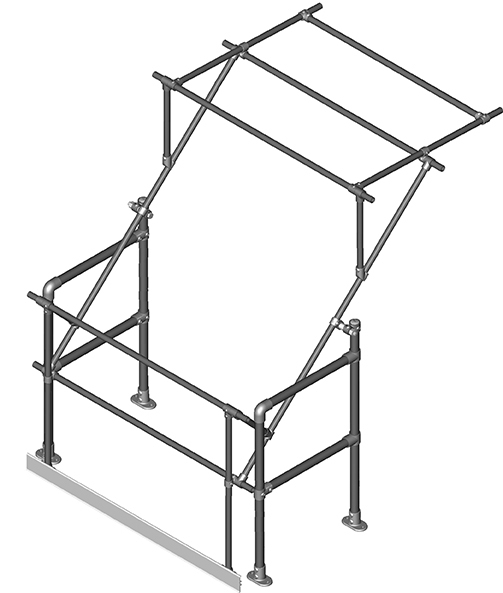 Due to the nature of the system, in the event of the pallet safety gate being damaged from a forklift or general use, the individual fittings can be easily replaced. The KEE GATE Pallet Gates range has been designed to be fully adjustable in width and can accommodate openings up to 1.8m. Our pallet gates are available in four different configurations to suit the type of operation required. 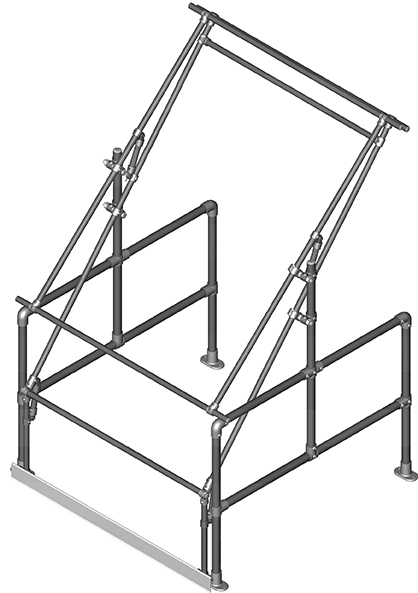 The Pallet Gate Type A is balanced for a positive open and close action. A toe-board is mounted on mezzanine edge side to protect workers below. This gate accepts pallets up to 1.4m x 1.48m with a maximum height capacity of 1.6m. 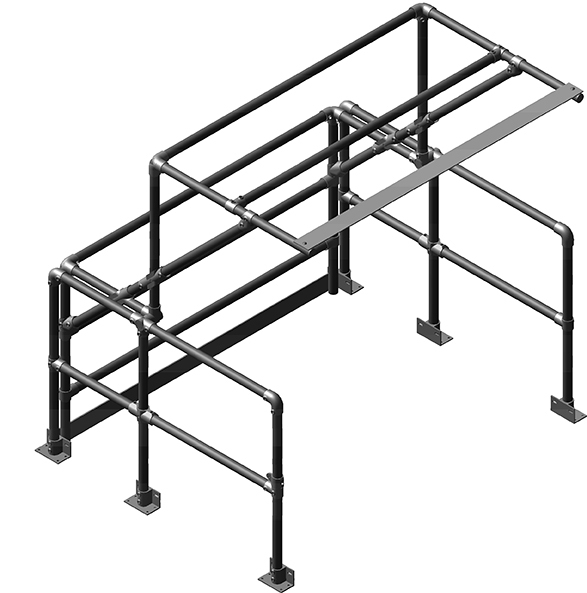 The Pallet Gate Type B is perfect for use on mezzanines where space is limited. The design of this gate means less floor space is required to load and unload pallets. The gate is balanced for a positive open and close action. A toe-board is mounted on mezzanine edge side. This gate accepts pallets up to 1.4m x 1.48m with a maximum height capacity of 1.8m. The Pallet Gate Type C offers the tallest capacity of the Kee Gate Pallet Gates. The cantilever design of this gate provides maximum height with minimal ceiling height requirement. Balanced for a positive open and close action. A toe-board is mounted on mezzanine edge side. This gate accepts pallets up to 1.4m x 1.48m with a maximum height capacity of 2.2m. The Pallet Gate Type D offers the widest load capacity of the Kee Pallet Gates range. The design of this gate provides maximum load width, whilst also offering 2m head clearance for workers. 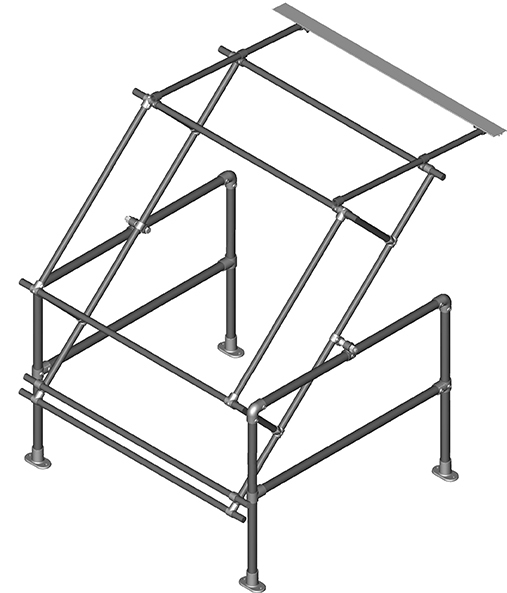 The gate type D is made from Aluminium and is balanced for a positive open and close action. A toe-board is mounted on all sides to protect the gate from pallet contact. This gate accepts pallets up to 1.4m x 1.9m with a maximum height capacity of 1.6m.